The Art of Pottery is bound to the voyage of human civilization. Humble earthenware storage jars and cook pots were instrumental in facilitating the growth and success of the first cities 10,000 years ago. Ceremonial vessels and figures marked the passing of significant individuals and events. Cultural connections have been established and maintained through pottery forms and surface patterns. In my exploration of pottery I have been drawn to the decorative surface of Mediterranean works from the bronze age to medieval times and how those patterns work as a link of familiarity from Western culture to that of ancient Persia and through the Silk Road to China and the East. I layer these connections and influences in color, pattern and imagery to construct loose, metaphorical narratives that might spark conversations about the nature and direction of our civilization in the intimate spaces pottery tends to occupy. Pottery, to me, is an art of connections. I would like to facilitate connections between people, cultures, and our shared human story through the use and exchange of significant objects for daily use. My pots are made with an earthenware clay and brushed over with a white clay slip. They are either stamped with hand carved clay stamps or incised with a sharp stick. The historically inspired, highly alkaline glaze is applied by pouring or by brush and is colored with iron, copper and cobalt. It is my hope that this work will help create new meanings, connections, and illuminations as it enters people’s lives. Paul Linhares is a central Ohio teacher and ceramic artist. He received his BFA in 1991 from Southern Illinois University, Carbondale and his MFA in 2000 from West Virginia University. He has been an adjunct ceramics professor at Mount Vernon Nazarene University and North Central State College, Mansfield in addition to a post as visiting faculty at the Chautauqua Institution School of Art. In October of 2014, Paul produced a one person show, The Art of Connections, for the Canton Museum of Art. 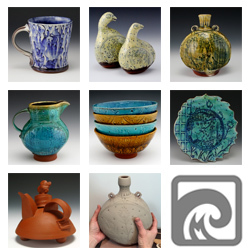 His work has been exhibited in Cedar Creek Gallery’s National Teapot Show VIII & VII, the 9th, 12th, 16th, 17th and 18th Strictly Functional Pottery National, Rosewood Gallery’s Earth in Balance, the Utilitarian Ceramics National, 1999 NCECA Regional Exhibition, and numerous other exhibitions. Paul’s pottery has been featured in both Ceramics Monthly and Pottery Making Illustrated in addition to 500 Cups, 500 Plates and Platters, 500 Teapots vol.2 by Lark Books, and iPotters (the enhanced ebook) by Kevin Hluch.